There are lots of stations within the LOFAR network, some of which have been completed and others that are being constructed this year. And, for the 2011 build season, KAIRA (FI609) is not the only one! Our colleagues in Sweden are busy building a full international station at the Onsala Space Observatory (OSO). As they are far to the south, the snow has already melted there and they are off to an early start. 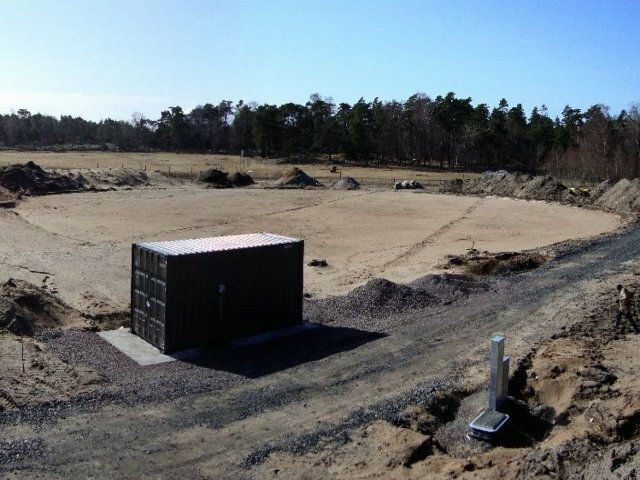 The RF-container and LBA field at Onsala. Photo: Leif Helldner, OSO. Some of the ground work was already completed last year, prior to the first snow. So that means that the field was already level when they went to start work this season. Already, the RF-container is in place and the work has moved on to the antenna fields themselves. Laying the LBA cables for LOFAR station SE607. Photo: Haukur Sigurdarson, OSO. As can be seen, the LBA field has been set out and the cables are being put in place. According to the ASTRON schedule, the SE607 HBA will be installed just prior to our installation at Kilpisjärvi, so we can expect to see lots of action there in Onsala over the next couple of weeks. Like us, the Swedish project also have a web log with lots of photographs and interesting articles about their project. Thanks go to Leif Helldner from OSO for his assistance and for permission to use some of their photographs.